A 41-year-old female presented to the emergency department (ED) with a several-day history of abdominal pain, nausea, vomiting, and lightheadedness. She reported that she was currently five weeks pregnant after having in vitro fertilization (IVF) in which two embryos were implanted. She had a history of one prior miscarriage, but no other pregnancies. She reported that she was followed by an obstetrician (OB) and had had two normal ultrasounds during this pregnancy. The patient had no vaginal bleeding, vaginal discharge, fever, or chills. On exam, the patient’s initial vital signs were as follows: temperature 97.3° F, pulse 60 bpm, blood pressure 58/32 mmHg, respiratory rate 19, and oxygen saturation 98% on room air. The patient was in severe distress. Abdomen was diffusely tender and distended with guarding. Skin was pale and clammy. Resuscitation with intravenous fluids was initiated and bedside ultrasound (US) was performed. Free fluid was identified in Morison’s pouch, the splenorenal area, and the pouch of Douglas. Additionally, an intrauterine pregnancy was identified. These findings were discussed with OB and a formal ultrasound was ordered for further evaluation. Records were obtained from an outside hospital which showed that beta-human chorionic gonadotropin (hCG) had increased from 5945 to 27632 over the prior three weeks. 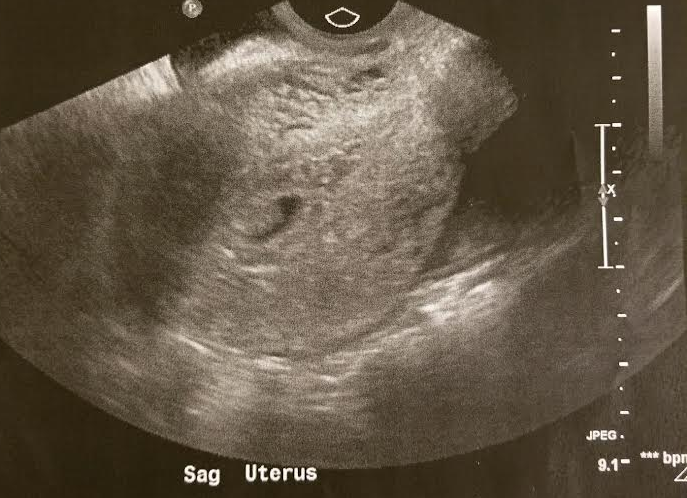 An ultrasound from the outside hospital one week prior to presentation showed a gestational sac at five weeks and five days with size less than dates, concerning for missed abortion. The patient’s complete blood count (CBC) was notable for a white blood cell count of 29.6, hemoglobin of 8.2, and hematocrit of 24.4, a decrease from 9.9 and 28.2 five days prior (and patient’s baseline hematocrit of 40.8 prior to pregnancy). The patient continued to be hypotensive after fluid resuscitation and two units of packed red blood cells (PRBCs) were ordered. 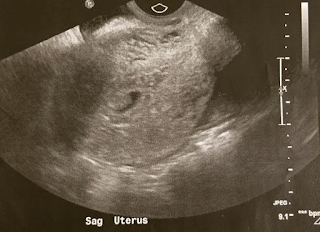 Formal ultrasound was performed and showed a single intrauterine pregnancy at 6 weeks and 1 day without cardiac activity, related to early pregnancy versus fetal demise (Figure 1). Ovaries were enlarged bilaterally, consistent with ovarian hyperstimulation (Figure 2). There was a moderate to large amount of free fluid, suspicious for blood, concerning for ruptured hemorrhagic ovarian follicle versus ruptured ectopic pregnancy. Based on ultrasound results, there was concern for ovarian hyperstimulation syndrome (OHSS) versus a ruptured heterotopic pregnancy. Given the patient’s decreased hemoglobin and hematocrit, hypotension, and free fluid, the patient was taken to the operating room. A total of 1400 mL of hemoperitoneum was present and active bleeding from a right tubal pregnancy was identified. The hemoperitoneum was evacuated and right salpingectomy performed. The patient received an additional unit of PRBCs and four liters of crystalloids perioperatively and vital signs stabilized. She was discharged home the following day with plan to have a follow-up ultrasound in a few weeks to evaluate the intrauterine pregnancy. In vitro fertilization is the most common type of assisted reproductive technology (ART) used to achieve pregnancy. While it is the most successful type of ART, it is associated with several complications. The most common complications include spontaneous abortion, ectopic pregnancy, and multiple gestations. Two less common, but life-threatening complications, are heterotopic pregnancy and ovarian hyperstimulation syndrome. IVF often involves the use of controlled hyperstimulation to increase the number of oocytes obtained, but OHSS occurs when hyperstimulation of the ovaries results in third-spacing of intravascular fluid. This is thought to be triggered by hCG release, which results in the release of vasoactive substances, increased vascular permeability, and third-spacing. This may occur as early-onset, in which it is due to the administration of hCG given for follicular maturation, or late-onset, in which hCG production is pregnancy-induced. Other etiologies, such as mutations in the follicle-stimulating hormone (FSH) receptor, have been identified, but are significantly less common. While signs and symptoms of OHSS vary with severity, they can include nausea and vomiting, abdominal pain, weight gain, ascites, pleural effusion, and hypovolemia. Severe and critical OHSS can manifest as renal failure, arrhythmia, disseminated intravascular congestion (DIC), and acute respiratory distress syndrome (ARDS). 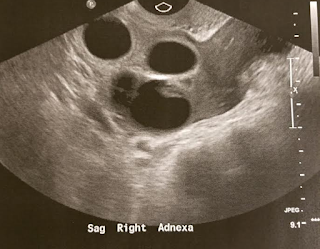 Imaging may show enlarged ovaries (due to hyperstimulation) and free fluid (due to third-spacing). Labs that support the diagnosis of OHSS are elevated hematocrit, elevated WBC, and elevated creatinine. Importantly, other complications of IVF can mimic OHSS on imaging, as free fluid can be hemoperitoneum due to ruptured ovarian cyst or ectopic pregnancy. However, these conditions are associated with decreased hemoglobin and hematocrit, rather than hemoconcentration. In fact, while this patient had features concerning for OHSS—free fluid, evidence of hyperstimulated ovaries, elevated WBC—the decrease in hemoglobin and hematocrit was crucial in making the diagnosis. Treatment of OHSS depends on its severity, which can be classified as mild, moderate, severe, or critical. Mild and moderate OHSS are typically self-limited and can be managed as an outpatient with conservative treatment and close follow-up. Severe and critical OHSS require hospitalization, and treatment is focused on maintaining intravascular blood volume and preventing complications. Heterotopic pregnancy, in which there are two simultaneous pregnancies at different implantation sites, is extremely rare with spontaneous conception (1/30,000 pregnancies), but occurs more frequently in pregnancies achieved with ART (approximately 1/100 pregnancies), making the overall incidence approximately 1/3900 pregnancies. The incidence increases as the number of embryos transferred increases. Signs and symptoms of heterotopic pregnancy are largely the same as those of ectopic pregnancy—abdominal pain, vaginal bleeding, and hemodynamic instability. Diagnosis relies heavily on the practitioner’s clinical suspicion; many heterotopic pregnancies go undiagnosed until they rupture because the presence of an intrauterine pregnancy can distract from the potential presence of an additional pregnancy. Even in the case of rupture, the presence of free fluid may be deemed ascites due to OHSS, rather than hemoperitoneum from a ruptured ectopic pregnancy. Therefore, eliciting a history of risk factors for ectopic pregnancy and using labs to determine the presence of anemia versus hemoconcentration are important. Ultimately, definitive diagnosis typically depends on surgical evaluation. Treatment of a heterotopic pregnancy is like that of ectopic pregnancy, though medical therapy is not recommended due to the presence of a concomitant intrauterine pregnancy. Salpingectomy is the first line treatment in hemodynamically unstable patients or those with tubal rupture. While unruptured pregnancies may be managed with injection techniques, they often require laparoscopic intervention. After treatment of the ectopic pregnancy, one out of three intrauterine pregnancies will result in spontaneous abortion. The patient had a follow-up ultrasound three weeks later to evaluate the intrauterine pregnancy. The ultrasound showed an irregular intrauterine gestation sac consistent with gestational age of five weeks and five days, compared to expected age of eight weeks and three days, with absent fetal heartrate, suggestive of intrauterine fetal demise. IVF is associated with increased incidence of pregnancy-related complications, of which OHSS and heterotopic pregnancy can be life-threatening. OHSS presents in a patient with history of ART who presents with evidence third-spacing, such as ascites and hemoconcentration. The presence of an intrauterine pregnancy does not rule out an ectopic pregnancy, especially in a patient who has received ART. 1. Golan A, Ron-el R, Herman A, et al. Ovarian hyperstimulation syndrome: an update review. Obstet Gynecol Surv 1989 Jun;44(6):430-40. 2. Lyons CA, Wheeler CA, Frishman GN, et al. Early and late presentation of the ovarian hyperstimulation syndrome: two distinct entities with different risk factors. Hum Reprod 1994;9(5): 792-9. 3. Navot B, Bergh PA, Laufer N. Ovarian hyperstimulation syndrome in novel reproductive technologies: prevention and treatment. Fertil steril 1992;58:249. 4. Practice committee of American Society for Reproductive Medicine. Ovarian hyperstimulation syndrome. Fertil Steril 2008 Nov;(5 Suppl):S188-93. 5. Cheng PJ, Chueh HY, Qiu JT. Heterotopic pregnancy in a natural conception cycle presenting as hematometra. Obstet Gynecol 2004;104(5 Pt 2): 1195-8. 6. Louis-Sylvestre C, Morice P, Chapron C, Dubuisson JB. The role of laparoscopy in the diagnosis and management of heterotopic pregnancies. Hum Reprod 1997;12(5): 1100-2. 7. Goldstein JS, Ratts VS, Philpott T, Dahan MH. Risk of surgery after use of potassium chloride for treatment of tubal heterotopic pregnancy. Obstet Gynecol 2006;107(2 Pt 2): 506-8.